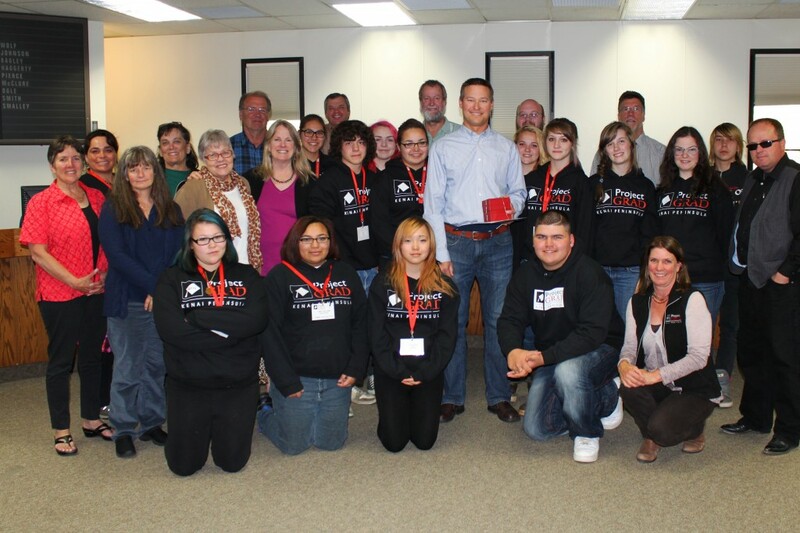 Golden Apple awarded to Mike Petersen, Project GRAD, and students from the 2014 Summer Institute surprise Mr. Petersen at the school board meeting! Mike Petersen’s contribution to Kenai Peninsula Borough School District students started in 2004, when he moved from Saipan International School to Homer, Alaska. A math and literacy coach with Project GRAD Kenai, he began by serving our schools in Nanwalek and Port Graham. Mike was interviewed and hired over the Internet, and flew directly from his former position to Houston, Texas, to meet his new Project GRAD team and receive training. Rita Pfenninger, a former Project Grad coach, recalls that when the Kenai team waited in the hotel lobby to meet Mike, they watched the door and wondered if he would arrive suited and formal like many of the gentlemen entering the lobby. When Mike arrived they knew immediately that he would fit in well with the team due to his open, friendly, and casual manner. In addition to data collection, Mike provided school staff with professional development based on best practices; he actively modeled lessons and consistently provided instructional support. As a coach, each week he flew to Nanwalek and Port Graham where the chances of being weathered in can be a very real problem. Mike was never afraid of what the weather might do. Once in the village he didn’t watch the weather, but focused on the job. He always arrived with a back pack ready to extend his stay if necessary. Project GRAD hosts an annual summer institute for two weeks in June. The Institute provides Project GRAD students an opportunity to work together in teams and earn high school credit. From the beginning, Mike has been instrumental in both organizing and facilitating summer institutes. Mike facilitates courses such as orienteering and Kayak or Yurt construction, and students put to use math concepts such as measurement or angles to complete projects. In 2011, Mike moved from his coaching position to become the Project GRAD Kenai Executive Director. In this position Mike provides professional development to his team of coaches, works closely with the Project GRAD board, and continues to build strong community support for the Project GRAD program. He works collaboratively with KPBSD directors, administrators, and staff to continue the development of support systems to ensure student success for all KPBSD students. 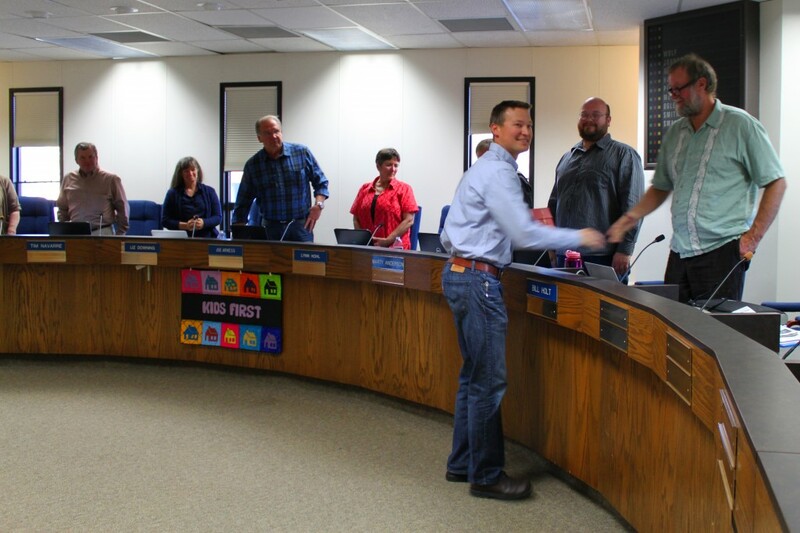 The Kenai Peninsula Borough School District Board of Education is proud to recognize Mike Petersen for his dedication to the students of the school district, past, present, and future. This entry was posted on June 2, 2014 at 7:34 pm. You can follow any responses to this entry through the RSS 2.0 feed. You can skip to the end and leave a response. Pinging is currently not allowed.